The Kolalander has been developed by local guides on the Kola Peninsula in Russia. It is attractive, colourful and sparkles which together with the remarkable movement created by the long tail makes it an extremely successful fish taker that often promotes thunderous takes. Bottle Tubes : 12-22 mm. Body : Bottle tube ribbed and butted red Glo-brite floss No.9 yellow. Wing : Orange DNA holo-fusion, orange arctic fox, orange and yellow DNA holo fusion, bright yellow arctic fox, spring green DNA holo fusion, fluorescent green arctic fox, spring green DNA holo-fusion and copper angel hair, brown arctic fox, copper angel hair, black arctic fox, black DNA holo-fusion. Hackle : Yellow over insect green. 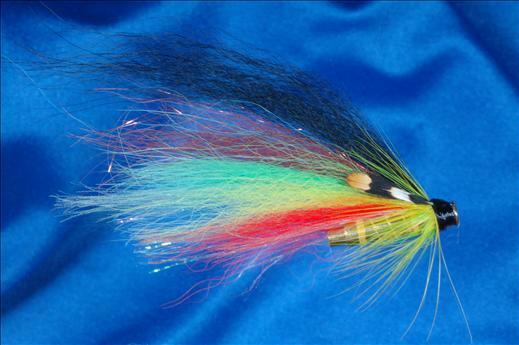 Currently there are no comments about the Kolalander fly pattern from other fly fishermen yet.